I have not been blogging much here the last couple of months, mostly because I have not been travelling but also because I have been quite busy. Today, however, I have something interesting to tell. About two years ago I was visiting my best friend Oskar in Dubai and we went to Abu Dhabi over the day to “Jas Waterworld”. Jas Waterworld is an amazing water park with several, really cool water slides. The best, and scariest, one is called the Liwa loop and it goes something like this. You walk into something that looks like a transparent coffin and you hear a voice countdown: “3…2….1…” after which the floor opens and you fall some 10-15 meters down a hole, inside a water slide, you make a loop (!) and come out in the open after about 10 frightful seconds. This video used to have some 3.000 views but after a re-location I lost them. The other day, however, I put it on Reddit and this caught the attention of Unilad. 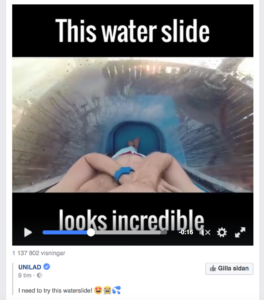 Unilad’s Facebook-page has 19 million followers and when they published the video (or a ripped version of it) I got over a million views of my video in one day! I have experienced viral stuff before but nothing of this magnitude! Pretty cool, huh? !